Turn your '08-Current Chevrolet Malibu into a tough looking family Sports Car with this great-looking "Camaroesque" four (4) piece Rally Stripe Graphics kit. 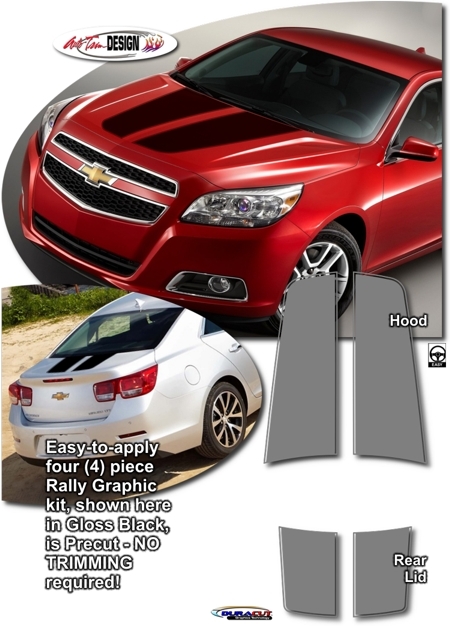 Graphics are specifically made for the '08-Current Chevrolet Malibu with factory Hood and Rear Lid areas as shown and will not fit any other vehicle (please see Graphic Fitment chart below). Stripe package is manufactured for a center spacing of 3" (7.62cm) at time of installation. Trimmable Spoiler Kit #ATD-CHVMLBUGRPH002 consists of two (2) pieces 16" (40.64cm) in length that can be trimmed during installation for custom spoiler applications.